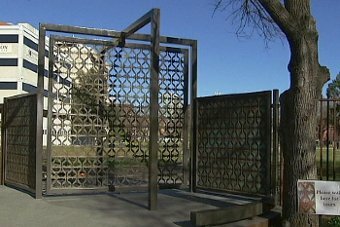 Australia: Health Minister John Hill, has opened the Adelaide Botanic Gardens' new Garden of Health and the Ginkgo Gate which links the western side of the gardens with Frome Road. More info and larger photo here. 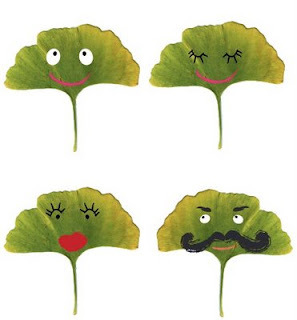 Lovely Ginkgo Friends by illustrator Amy Cartwright. * New photo photospecial page: Large Ginkgo tree in Ravenna, Italy. 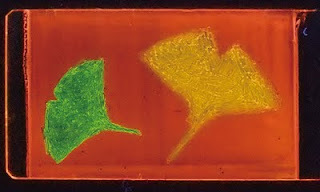 * Added new topic: Film on Ginkgo biloba: 'The sea in the seed'. My website The Ginkgo Pages. My videos on YouTube. Very interesting research film 'The sea in the seed, sperm of Ginkgo biloba and reproductive evolution in plants' , produced by Okada Kazuo; the best scientific film award at Ronda, Spain and TEPIA Grand Prix in Tokyo (2000) - TokyoCinema Inc.
To watch the English version click here. Text click here. * Update April 2011 topic "Hachiman Ginkgo broke after 1000 years". * Update on Name-page: revised version research by Prof. Wolfgang Michel on spelling of Ginkgo. Etched on a photoluminescent display, these liquid crystal Ginkgo leaves can shift through a trio of autumn colours under the glow of UV light. Previously, displays made from a single luminescent organic or organometallic compound could only switch between two colour states. Now Takashi Kato and Yoshimitsu Sagara of the University of Tokyo have developed a reversible display that glows red-orange, green or yellow in response to temperature and mechanical force. The display consists of a mixture of two compounds, one of which harbours a fluorescent centre. When the mixture is heated to 146°C and then cooled to room temperature, it forms the red-orange state. A summer green appears after heating the red-orange colour state to 90°C, applying mechanical shear with a spatula, and then cooling it back to room temperature. Either the red-orange or green states can revert to yellow by shearing the mixture at room temperature. The findings could be used to develop more cost effective multicolour displays. Journal reference: Angewandte Chemie, DOI: 10.1002/anie.201100914. New York City, Manhattan — An Inwood church brought a splash of color to a neighborhood middle school - Inwood Academy for Leadership - , painting a 1,000-square-foot Ginkgo mural in the outdoor cafeteria as part of its outreach to the community. 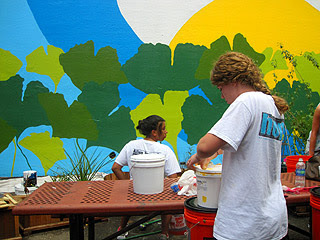 The recently created Everyday Church, spearheaded the mural project with the help of a church group that was visiting from Richland Hills, Tex. Ohio artist Tim Parsley, flew in to design the mural. 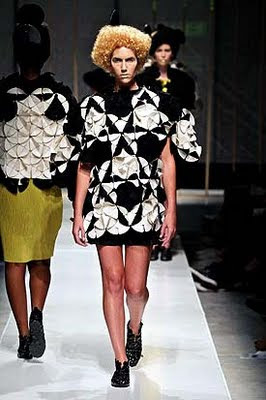 Black Coffee fashion design presented during the South Africa Fashion Week Summer 2011. Part Ginkgo leaf, part futuristic seminal shape, the disks became a "modular system of interlocking laser-cut garments". Black Coffee is South African fashion designer Jacques van der Watts label.